I was halfway knitting my Christmas snowman and suddenly mom told me she wanted to learn knitting! So putting the snowman aside, I design this scarf for her. Scarf is the easiest to knit as you don’t need to join any parts together. You can knit a really simple scarf only knowing 3 skills, CO (cast on), knit and BO (bind off). 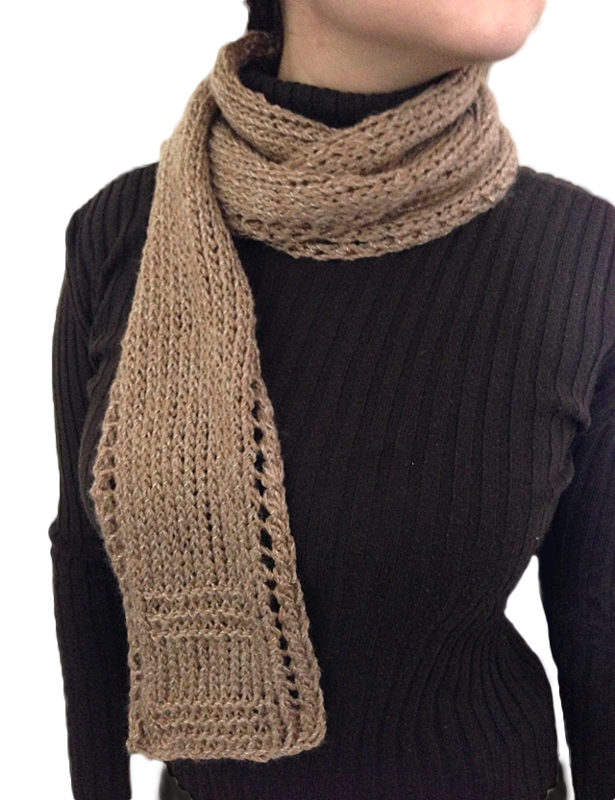 But having said this, mom wanted a pretty scarf so I design something a little more complicated but still relatively easy for her to start as her first project. The scarf has lace borders, but not too feminine so a guy could also wear it. It’s easy to knit and will be suitable for beginners. Plus, I will also include video tutorials below so anyone can follow with ease 🙂 We use 2 balls of yarn (50g each), so if you have 100g balls then you only need 1 ball. 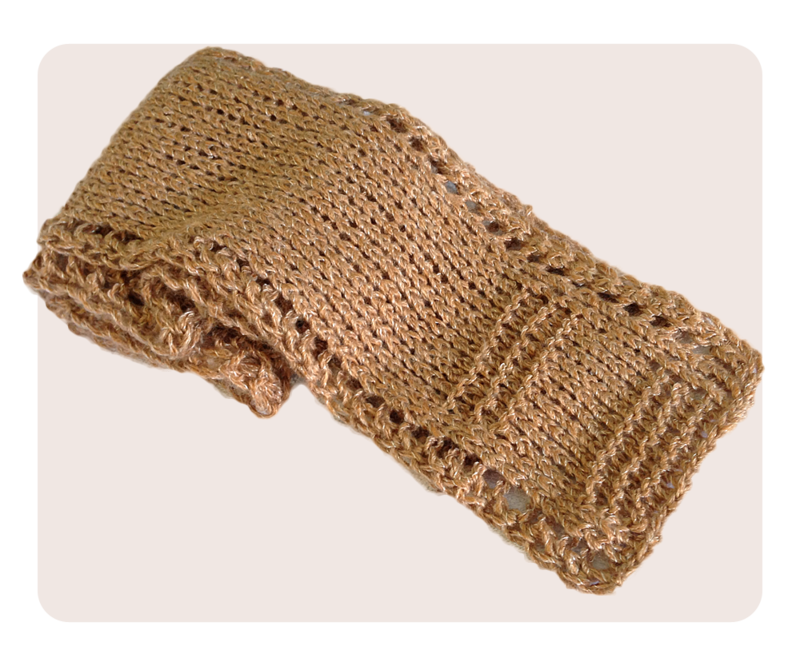 – The texture of this yarn is a close match. 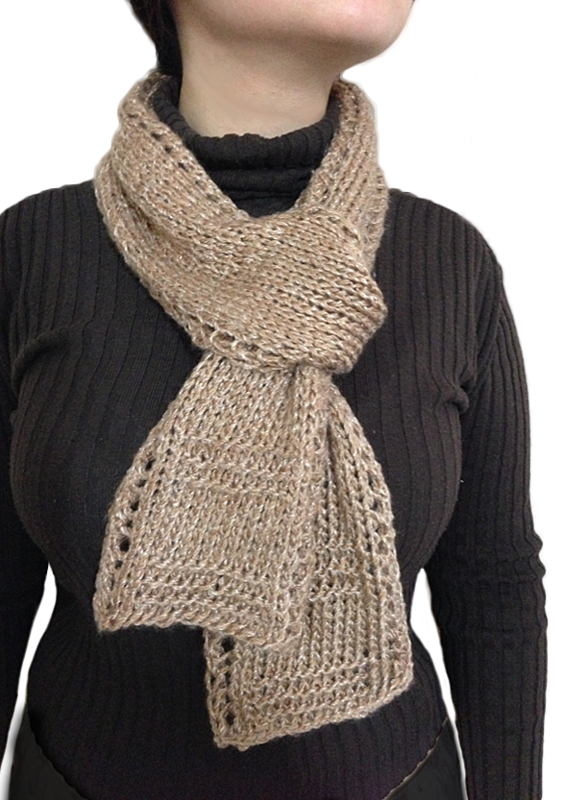 – The qualities of the fibers in this yarn (elasticity, drape, warmth etc.) are a very close match. – This yarn comes in 50g / 105m balls. For each ball of the original yarn you will need 0.81 balls of this. 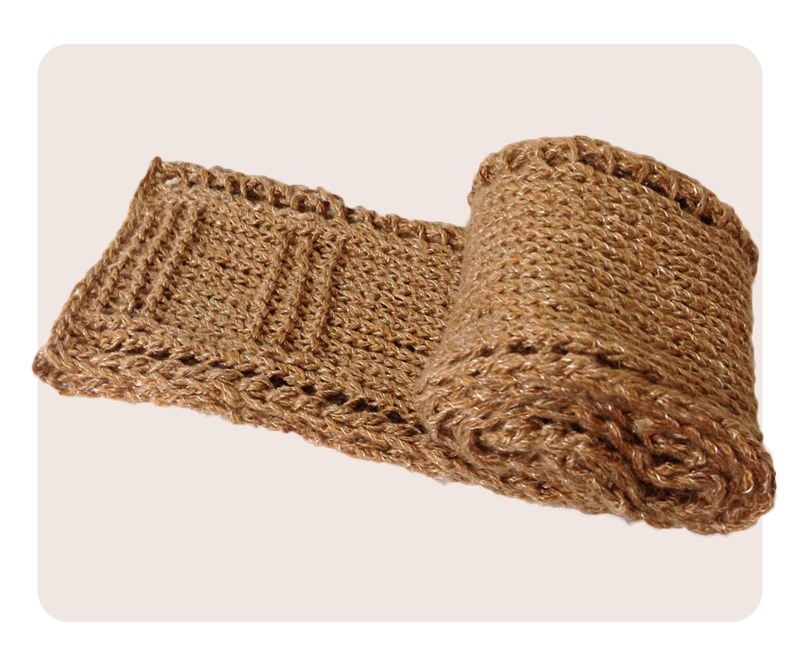 – The warmth, drape, elasticity, durability and softness of this yarn is a reasonable match with the original. – This yarn comes in 50g / 90m balls. For each ball of the original yarn you will need 0.94 balls of this. – This yarn also has a regular, smooth texture, but it is s on s plied rather than plied. It is still a good match, but the ply structure of yarn has an effect on the finished fabric. – This yarn is less dense, giving a loftier feel. Your garment will be lighter than with the original yarn. – The gauge almost matches, but you may need to use larger needles. – This yarn comes in 100g / 240m balls. For each ball of the original yarn you will need 0.35 balls of this. Not important as it doesn’t need to fit. *Tips* Use big needles if you are just starting out to make it easier. Row 1: Slip 1st stitch Knit wise, then K until end of row. Row 2: Slip 1st stitch Purl wise, then P until end of row. I like to slip my 1st stitches to create a nice even edge on both sides. Row 4: Slip 1st stitch Purl wise, then P until end of row. Row 10: Slip 1st stitch Purl wise, then P until end of row. Row 11-14: Repeat Row 9 & 10 two times. Row 15-20: Repeat Row 3 & 4 three times. I leave approx 1.2meter of yarn then I start the finishing. You may want to measure your remaining yarn as we all have different tension. To finish, you need to start on the right side of the fabric (the odd rows). This means you have just finished doing your Purl rows. Row 3-6: Repeat Row 1 & 2 two times. Row 8: Slip 1st stitch Purl wise, then P until end of row. Row 9-12: Repeat Row 7 & 8 two times. Row 13-18: Repeat Row 1 & 2 three times. Cut any remaining yarn you have left over and weave in ends. The lace border tends to curl up, so block the materials after it’s finished to get a nice flat surface. Tadaa! you have finished. Happy knitting! easy knitting patterns, free knitting patterns, knitted scarf, straight needles, very easy knitting patterns. Bookmark. I am so happy that you have access and the knowledge to know how to find things on Google. SOME of us, apparently, aren’t as intelligent as you are. But…….. thank you, Lisa, for the answer. As long as you’re including yourself amongst the people who couldn’t look up the answer themselves then I’m ok with it. I must say it really surprises me that people can’t google the answers they need. Patons Zhivago Yarn is a worsted weight yarn, 93 yards per 50 gram ball and is 50% acrylic and 50% tercel. I see that the last comment was made 10 months ago and there was no answer. I would REALLLLLY like to know the yarn size – the name of it doesn’t help me in the least – and I see that it’s discontinued. PLEASE will you let Ines and I know about the yarn??? Hi Jeannie.. Sorry for the late reply, I have been away.. Lisa has helped with the answers.. For yarn substitute I will recommend different yarn with recommended 7mm needle size. A different brand will work as long as the thickness of yarn is similar with the original one. Hope this helps.. I just found this beautiful scarf. However, the yarn is discontinued. I looked in Yarn Substitution website and they are recommending yarns w different needle sizes. Would that work? Any suggestions on yarn? Thank you for your feedback and for sharing the beautiful pattern. Hi Ines.. Sorry for the late reply, I have been away.. For yarn substitute I will recommend different yarn with recommended 7mm needle size. A different brand will work as long as the thickness of yarn is similar with the original one. Hope this helps.. I just finished making this scarf. Was super ready and looks wonderful! Thank you for sharing the pattern.